Burgundy (62 days) Very attractive plant sporting 6-8in. red pods. Good variety for cooler summers. Pick pods when 2-3in. long. height: 4ft. 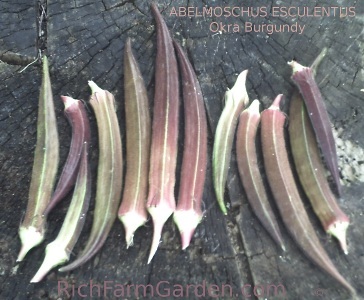 Clemson Spineless (55 days) Long straight pods with no spine - a favorite for gumbos and for frying or pickling. Best picked when about 2-3 in. long. height: 4-5 ft.
Louisiana Green Velvet (Green Velvet, Emerald Green) 60 days - Tall vigorous plants with bright yellow blooms and 7-8 inch smooth pods. Retains its color when cooked or canned. This is the preferred variety for cajun and creole cooking. height: 6ft. 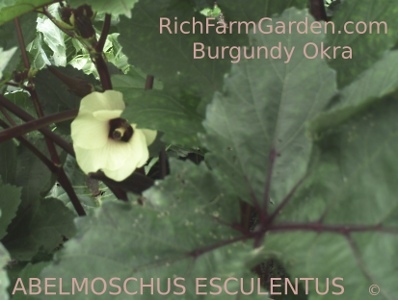 There is great diversity in the okra varieties that we offer; which makes the general information provided only valuable as adjustable guidelines. This may also affect your seed planting and propagation strategies and the germination rates under your planting conditions may vary from the seed lot test results. The following soil temperature data is for okra in general. Temperatures are average daytime from planting to emergence. Percentage is average germination rate. Days is number of days to emergence.